Finding myself newly married, enduring my first gray Pittsburgh winter, and holed up in a tiny second-floor apartment surrounded by concrete, I decided to invent a family tradition: tea on the first day of spring. I can't remember what the menu was for that first tea, but I remember spending a good bit of time preparing and then pulling out the teacups for my husband and I to enjoy the feast together. Over the years our tea has changed. Many years it is now just the children and I who partake as my husband might be busy with work. One year I was too sick to bake anything and I think we had to buy a baked good to enjoy. Two things are now absolute tradition: we use the early spring flowers embroidered tablecloth I found one day in a secondhand shop and we always have strawberries. 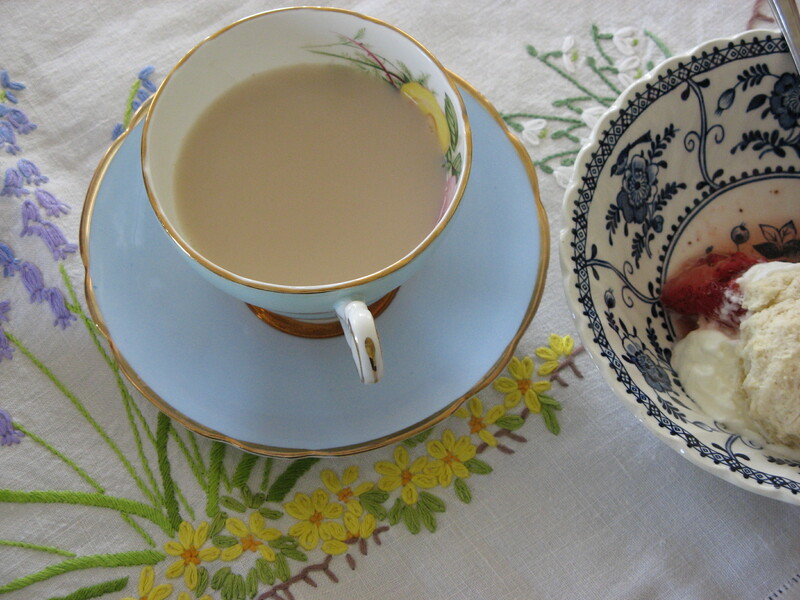 On the day of spring tea I don't care that strawberries are out of season and taste like watery styrofoam. They are a harbinger of things to come and that's what our spring tea is all about. Wash strawberries. Cut a tiny bit off the bottom of each berry so it can stand on a plate. Cut the green leaves off the top and, using a strawberry huller or small melon baller, gouge out a bit of the inside of the strawberry. Soften the cream cheese and beat in an electric mixer until smooth. Add the heavy whipping cream and sugar as well as lemon zest if using. Beat until the cream and cream cheese combine and thicken. Transfer cream cheese mixture to a piping bag and pipe into the strawberries. Refrigerate if not eating immediately. 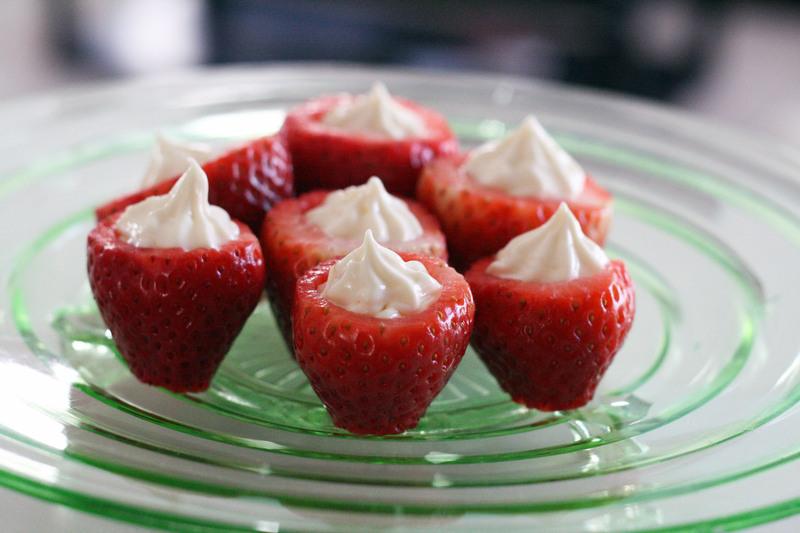 Optionally, you can add a flake of chocolate to the top of each strawberry. Awww, those look SOOOO sweet =P Cute, adorable, just darling :-) Those would also be delicious served at a get-to-gether with girlfriends; pretty little gems filled with a swirl of rich cream to snack on whilst we gab the day away. Hehe. Just wish we had strawberries over here in Uganda but alas, they're not usually available (or *cough* those that are, are exorbitantly priced!!). Any other ideas on fruit I could use? Especially tropical fruit?? Thanks!! This is another recipe I had bookmarked to use sometime. I'm going through a bunch of my saved recipes trying to decide what to make for my birthday garden party this weekend, these are perfect!